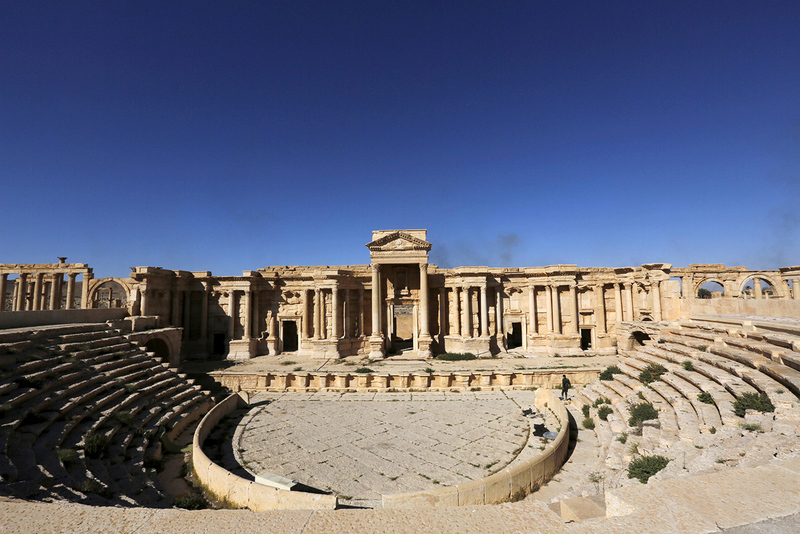 Islamic Terror group destroys part of Roman theater in ancient Syrian city. On Jan. 20, Syrian state television reported that militants from the Islamic State terrorist group had destroyed the facade of the Roman Theater and the Tetrapylon architecture complex in Palmyra. The news report did not specify the extent to which the ancient monuments had suffered in the act of vandalism. Timur Karmov, scientific advisor at the Russian Culture Ministry Heritage Institute, said latest information he had received suggested the militants had not blown up the entire amphitheater but only the façade and structures adjoining the stage - the easiest sections to demolish. "The monolithic stands are more difficult to blow up. You need more explosives and effort. Concerning the Tetrapylon, the small structure near the theater, this was simpler to destroy. It was a prefabricated structure standing on four columns and blowing it up required a small quantity of explosives," Karmov said. "It seems that the entire top was blown off, only the foundation remains." Karmov added that the institute had received details of the destruction via photos taken with satellites provided by Boston University. Speaking on Jan. 18, Lieutenant-General Sergei Rudskoy, Chief of the Russian General Staff Main Operations Department, said that ISIS militants were moving weapons and manpower "almost without impediment" towards Palmyra. According to Rudskoy, the Russian military have received information "on a large amount of explosives being moved to the area of Palmyra as ISIS terrorists are aiming to destroy the world cultural heritage in the town." ISIS attacked Palmyra on Dec. 9, 2016. They attempted to seize oil installations and a military aerodrome near the city. On December 11 Syrian government forces retreated from the ancient city, which they had taken on March 27, 2016 with the help of Russian air support. Russian sappers later participated in removing mines from the city and its ancient monuments. The theater in Palmyra is not the biggest of similar ancient monuments preserved in the Middle East, thought it is considered unique. Before the current destruction, the Roman theater in Palmyra was noted for the high level of its preservation, Karmov said. "If we speak about its restoration, there exist sketches, plans and photographs of the structure, that is, material that can be used for the work. Fortunately, researchers from various countries have managed to photograph all this. Therefore, I think that with the right resources and efforts, restoration will be possible."